Mmmmm weekend breakfasts are the best. I get a little more fancy and decadent since we have the time to linger in the kitchen and enjoy every bite. Ever since I bought Tim a waffle maker for Christmas, I've been thinking about all the amazing recipes we could try. 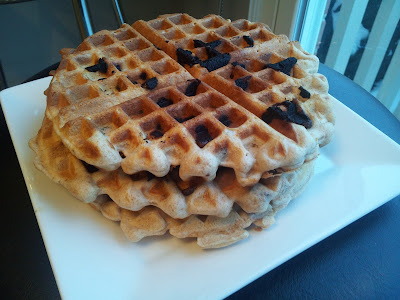 This weekend, we tried some delicious whole wheat waffles with chocolate chips. I used dark chocolate morsels, but milk chocolate or semi-sweet chocolate would be delicious as well. Whisk together all the ingredients together except the chocolate chips, then allow to sit for five minutes. In the meantime, preheat the waffle iron to medium-high heat. Mix in chocolate chips, then spray the waffle iron with vegetable oil and add 1/2 cup of batter. Cook for three minutes, or until the waffle reaches the level of crispness you prefer. This recipe makes three large waffles.